from here. Past the mid point, made a free hand, short row, medallion to turn the corner and I have started the decreases. The first half is just short of 20 inches.. so the final scarf will be about 38 inches along the straight edge. A nice size. From here on—every row is shorter, and shorter, and each inch faster to work, and soon it will be a scarf. I will need (if the scale is right) about 10gms of the second skein—but that's well under being a problem. I ALWAYS have left over sock yarn—and will have no trouble completing a pair of socks with 90gm. Especially if I add a round or two of solid green stripes at the cuff and at the toe. Or better yet, a round or two of patterned color work using the green. I have also decided--the tassels I plan for the tips of the scarf—are going to be made from the solid green—the Lion Brand green apple color way that is a perfect “go with” color for some of the darker green stripes in the yellow color way. 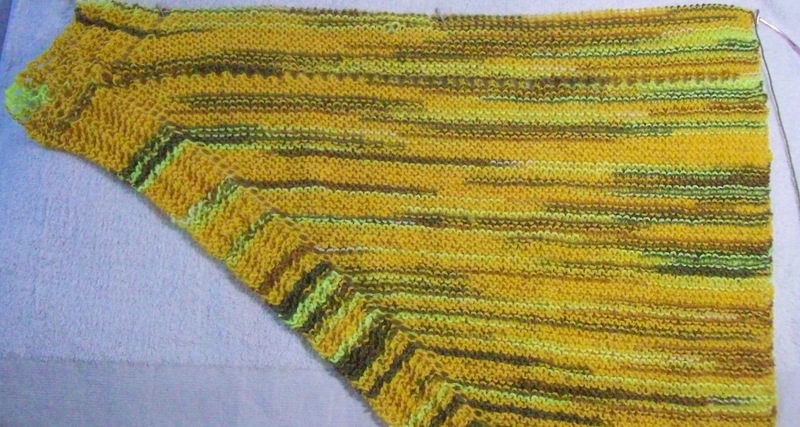 Then the scarf will be a natural go with yellow and green matching socks. The green yarn is already divided and packed up in sock kit bag—it's not next (to be socks) but soon. It will be easy to pull off some yarn for 2 small tassels. The pink and black skirt I am altering.. still not finished. But several 100 g skeins of sock yarn have been divide up into 50 g cakes---with more to come, since I haven't done the 4 newest balls of sock yarn, or the prussian blue (Lion Brand calls it sno cone)with beads --which is on my list of socks for this year. In spite of the fact that is mid month, and I haven't finished the secret sock yet, I am still sock obsessed. I want to start the next pair as soon as finish the scarf—so what if it is not April! And with all these projects not finished, I went and bought a small tray to start my seed with. 1 to start—but there might be a second. 36 little peat pellets to soak in warm water, and 36 little opportunities to start—Basil, parsley (2 kinds of each) some new chives, sage, oregeno and cilantro. A nice selection for the kitchen window planter. I think I will need a second little kit to start some summer flowers—Not that there seems to be any progress made on the terrace. I know, I know, they are working on 3 buildings, (and each building has 3 sides with terraces, and each building has 15 floors)—And a ton of work can be going on, and NONE OF IT on my terrace! But the weather has been so lovely, I want to open the terrace door and let in the fresh air. I want the scaffolding down, and all the sun light to pour in. I want all the terrace chairs and tables and planters back out on the terrace—and out of my living room. I want to sit out side and sip my morning coffee and enjoy the view. I want to watch seeds bud and grow, and to have a riot of flowers. All the simple things! Its not too much to ask, is it?